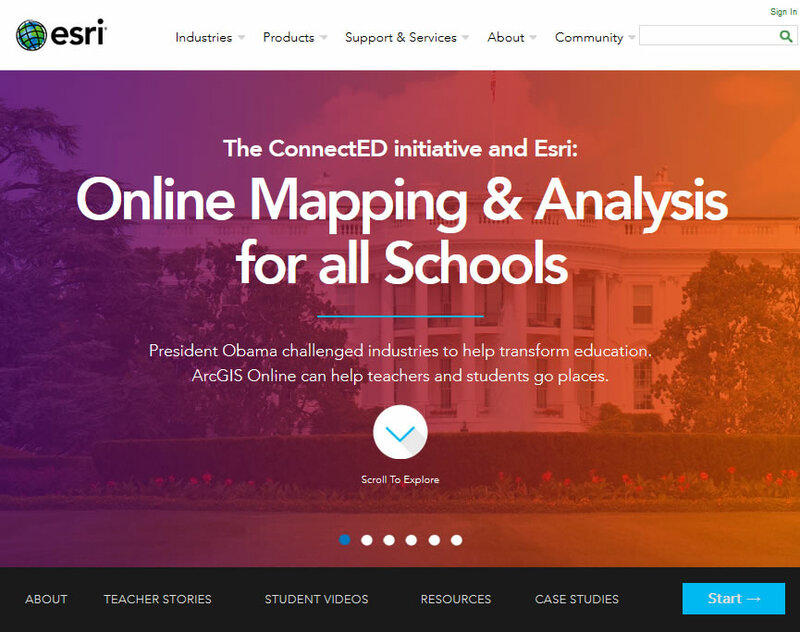 Esri President Jack Dangermond heeded a call from President Obama and offered free ArcGIS Online organizational subscriptions to all US K–12 schools. Imagine a world where students use maps to explore, discover, create, and share information; gain knowledge at any grade, in any subject; get a leg up on college and career; and support the community. And imagine they do it anytime, anywhere, on almost any device. This was the dream Jack Dangermond of Esri shared with President Barack Obama in a meeting at the White House. In 2013, the president launched the ConnectED Initiative, asking industry to help all K–12 students in the United States to participate in digital learning by providing devices, connectivity, learning resources, and teacher training. 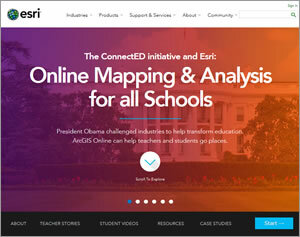 On May 27, 2014, at a White House event celebrating education, Obama said Esri had made a bold commitment, offering a free ArcGIS Online subscription for instruction to every US K–12 school. The contribution, potentially worth over $1 billion, could put web mapping technology into the hands of students at an estimated 115,000 schools. Even though education today is ensnared in politics, no one denies that students benefit from rich and integrated knowledge, analytical thinking, problem-solving skills, technical facility, and the capacity to collaborate and communicate. With its array of tools, galaxies of data, and diverse channels for exploration, GIS offers students a powerful way to learn. Projects and problems—ranging from the density of ants on the school playground to upheavals in global environmental and social patterns—are an invitation to engage. This online resource page provides guidance on how to use ArcGIS Online, teach with it, and connect with GeoMentors. 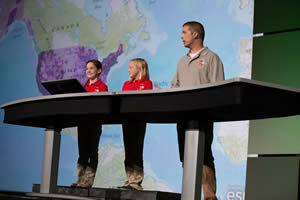 You also will find videos of students demonstrating how they use ArcGIS in their studies. For decades, the rap against GIS in schools has been that the hardware required is scarce, the system complex, the procedures arcane, and the activities contrived. No matter that students have made magic happen with maps—solving complex, real-world problems just like adults when given the chance. In those instances, learners, teachers, environments—or all three— were consistently deemed exceptional. At long last, the tide of technology is overcoming obstacles. ArcGIS Online requires no special hardware or software. ArcGIS Online subscriptions provide secure logins plus special powers like analysis and publishing along with data and tools. Kids are online accessing, viewing, modifying, and saving maps using laptops, tablets, and smartphones. Students can use the same maps on the family's Android tablet at breakfast, a classmate's iPhone on the way to school, an aging PC in the morning lab, an iPad in the library at midday, a Chromebook in an afternoon class, and a teacher's laptop after school. Children are drawn to the visual nature of maps and quickly learn to work with ArcGIS Online and data, developing skills and strategies with almost every click. GIS infuses science into social studies and melds mathematical analyses with communication skills. Maps become the means to tell complex stories about their communities and understand conditions and patterns of change around the globe. 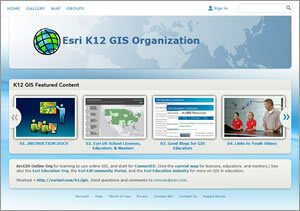 Educators will find a form to fill out to learn more about ArcGIS Online for schools at Esri's ConnectED site. There they will also see models on how to create an ArcGIS Online Organization for schools, examples of how students are using ArcGIS Online, resources such as online courses in how to teach with ArcGIS Online, and much more. 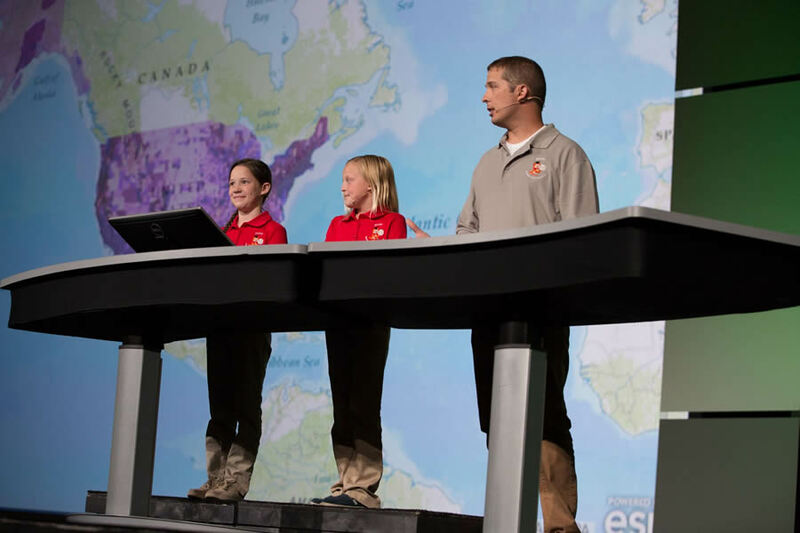 Fourth graders Rikki Vaughn (left) and Kylie Miller, with their teacher Josh Worthy, spoke at the Esri User Conference about how they used ArcGIS Online for class projects. The students attend Sonora Elementary School in Springdale, Arkansas. Educators can also seek a GeoMentor—a GIS user willing to help them use the technology—through the GeoMentor Program. GIS professionals have a background in using the technology, thinking spatially, solving real-world problems, and making a difference in the community. Across the country, in big cities and small communities, GeoMentors provide data, share mapping expertise, produce data layers for students to use, help with the design and operation of a subscription portal, and sometimes offer internships and even jobs to qualified students. Mentors and educators can register here and connect. 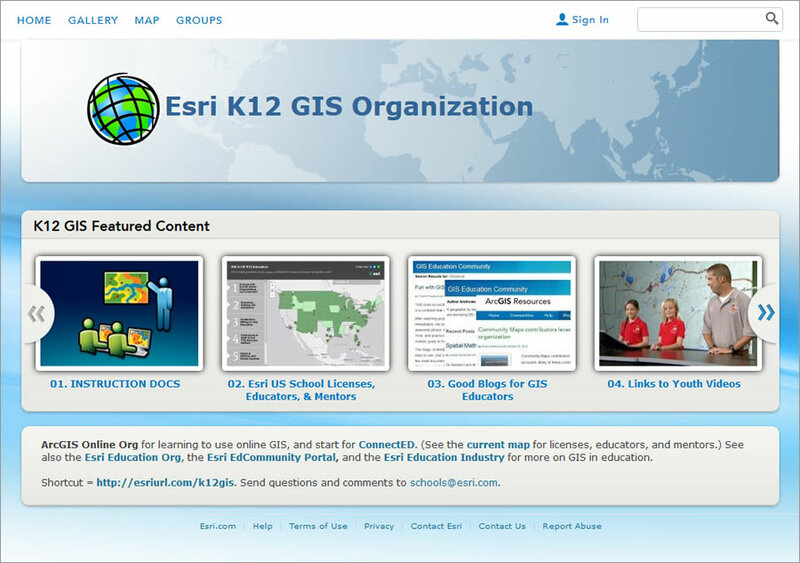 Educators also can access free instruction and buckets of ready-made maps and apps at the Esri K12 GIS Organization site. But one major obstacle remains: obtaining permissions. Sometimes it can be difficult to get approvals to let teachers bring in a GeoMentor, try something new and different like ArcGIS Online, or just give kids the OK to engage actively in online mapping projects. There will always be obstacles to getting some schools to try ArcGIS Online or welcome a GeoMentor. And the only way to overcome them is to build relationships among people and show them what students can accomplish with ArcGIS Online and assistance from a GeoMentor. Today's students are tomorrow's leaders. They need practice thinking critically, analyzing complex situations, solving problems, integrating information, adapting, and learning constantly. Imagine being led by people who grew up doing that . . . whose whole world is connected. Let's all do our part to make it happen.